The Guitar Festival of Ireland is a diverse concert/workshop series based in Dublin with the main art form being music. The guitar, in its many guises and musical forms takes ‘centre stage’ in the majority of the festival activities. The guitar as an instrument and as a symbol of musical expression has a very broad appeal. It is loved throughout the world for its versatility and capacity to express the spectrum of human emotion. The largest event of its kind in Ireland, the festival attracts top artists from around the world. The festival is organised by a voluntary committee deeply committed to guitar in Ireland and supported by the Arts Council, RTE, Royal Irish Academy of Music, Istituto Italiano di Cultura Dublino among others. 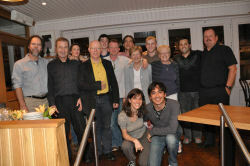 The Guitar Festival of Ireland is meticulously planned by an enthusiastic and passionately dedicated team. The artists chosen for the festival are of a world class standard from internationally acclaimed musicians to innovative new artists. Throughout the planning year our artistic personnel travel to several other well established international festivals in Europe, US and China. Attendance at these events allows us to better compare, plan and evaluate our own productions aswell as experiencing and aquiring new performers and planning new collaborations. Our engagement with the artists usually consists of performance/educational proposal with detailed programming requests (so we have a well balanced concert series throughout the festival), possible local collaborations and our expected outcome of their participation. 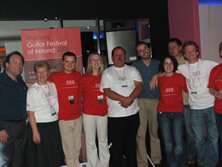 The Guitar Festival of Ireland is one of Europe ‘s most prestigious guitar festivals. Over the past 12 years it has grown to become one of Ireland ‘s best loved cultural events. There is something here for everybody whatever your musical interest is. The festival title itself has become synonymous with quality and excellence. It is now firmly established as a leading event in the Irish festival calendar and attracts thousands of visitors annually. Every year we have many short-term volunteers that help out during the festival period. It’s a great place to meet others and enjoy a real festival buzz. If you would like to be a volunteer in the next festival please e-mail us with your information detailing if you have any previous festival experience. All applications welcome.